In computing, an optical disc drive (ODD) is a disc drive that uses laser light or electromagnetic waves within or near the visible light spectrum as part of the process of reading or writing data to or from optical discs. Some drives can only read from certain discs, but recent drives can both read and record, also called burners or writers. Compact discs, DVDs, and Blu-ray discs are common types of optical media which can be read and recorded by such drives. Optical disc drives that are no longer in production include CD-ROM drive, CD writer drive, combo (CD-RW/DVD-ROM) drive, and DVD writer drive supporting certain recordable and rewritable DVD formats (such as DVD-R(W) only, DVD+R(W) only, DVD-RAM only, and all DVD formats except DVD-R DL). As of 2015, DVD writer drive supporting all existing recordable and rewritable DVD formats is the most common for desktop PCs and laptops. There are also the DVD-ROM drive, BD-ROM drive, Blu-ray Disc combo (BD-ROM/DVD±RW/CD-RW) drive, and Blu-ray Disc writer drive. Optical disc drives are an integral part of standalone appliances such as CD players, DVD players, Blu-ray disc players, DVD recorders, certain desktop video game consoles, such as Sony PlayStation 4, Microsoft Xbox One, Nintendo Wii U, and Sony PlayStation 3, and certain portable video game consoles, such as Sony PlayStation Portable. They are also very commonly used in computers to read software and consumer media distributed on disc, and to record discs for archival and data exchange purposes. Floppy disk drives, with capacity of 1.44 MB, have been made obsolete: optical media are cheap and have vastly higher capacity to handle the large files used since the days of floppy discs, and the vast majority of computers and much consumer entertainment hardware have optical writers. USB flash drives, high-capacity, small, and inexpensive, are suitable where read/write capability is required. Optical discs are used to back up relatively small volumes of data, but backing up of entire hard drives, which as of 2015 typically contain many hundreds of gigabytes or even multiple terabytes, is less practical. Large backups are often instead made on external hard drives, as their price has dropped to a level making this viable; in professional environments magnetic tape drives are also used. Current optical drives use either a tray-loading mechanism, where the disc is loaded onto a motorized or manually operated tray, or a slot-loading mechanism, where the disc is slid into a slot and drawn in by motorized rollers. With both types of mechanism, if a CD or DVD is left in the drive after the computer is turned off, the disc cannot be ejected using the normal eject mechanism of the drive. However, tray-loading drives account for this situation by providing a small hole where one can insert a straightened paperclip to manually open the drive tray to retrieve the disc. Slot-loading optical disc drives have the disadvantages that they cannot usually accept the smaller 80 mm discs (unless 80 mm optical disc adapter is used) or any non-standard sizes, usually have no emergency eject hole or eject button, and therefore have to be disassembled if the optical disc cannot be ejected normally. However, the Nintendo Wii, because of backward compatibility with Nintendo GameCube games, and PlayStation 3 video game consoles are able to load standard size DVDs and 80 mm discs in the same slot-loading drive. A small number of drive models, mostly compact portable units, have a top-loading mechanism where the drive lid is opened upwards and the disc is placed directly onto the spindle (for example, all PlayStation One consoles, portable CD players, and some standalone CD recorders all feature top-loading drives). These sometimes have the advantage of using spring-loaded ball bearings to hold the disc in place, minimizing damage to the disc if the drive is moved while it is spun up. Most internal drives for personal computers, servers and workstations are designed to fit in a standard 5.25" drive bay and connect to their host via an ATA or SATA interface. Additionally, there may be digital and analog outputs for audio. The outputs may be connected via a header cable to the sound card or the motherboard. At one time, computer software resembling CD players controlled playback of the CD. Today the information is extracted from the disc as data, to be played back or converted to other file formats. When the optical disc drive was first developed, it was not easy to add to computer systems. Some computers such as the IBM PS/2 were standardizing on the 3.5" floppy and 3.5" hard disk, and did not include a place for a large internal device. 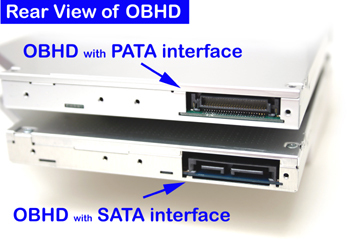 Also IBM PCs and clones at first only included a single (parallel) ATA drive interface, which by the time the CDROM was introduced, was already being used to support two hard drives. Early laptops simply had no built-in high-speed interface for supporting an external storage device. A parallel port external drive was developed that connected between a printer and the computer. This was slow but an option for laptops. CD recording on personal computers was originally a batch-oriented task in that it required specialised authoring software to create an "image" of the data to record, and to record it to disc in the one session. This was acceptable for archival purposes, but limited the general convenience of CD-R and CD-RW discs as a removable storage medium. 1 2 "Computer Peripherals - Chapter 12. Optical Disks" (PDF). Nanyang Technological University, Singapore. October 16, 2001. Retrieved 2011-07-16. ↑ Liadov, Maxim. "Sony BDZ-S77 Recorder Review". Digit-Life. Retrieved October 19, 2007. ↑ Taylor, Jim H.; Johnson, Mark R.; Crawford, Charles G. (2006). DVD Demystified. McGraw-Hill Professional. pp. 7–8. ISBN 0-07-142396-6. ↑ Stan, Sorin G. (1998). The CD-ROM Drive: A Brief System Description. Springer. p. 13. ISBN 0-7923-8167-X. ↑ Cross Section of DVD+R DL Optical Media. ↑ Page, M. Kenwood 72× CD-ROM Review. p. 2. Retrieved 2007-10-08. ↑ Spurgeon, Brad (December 11, 2004). "Spinning out of control: Risk of CD explosion". The New York Times. Archived from the original on March 25, 2014. ↑ "| Wii - General Information: System & Accessories". Nintendo. Retrieved 2013-01-07. ↑ PlayStation 3 Instruction Manual (PDF). p. 50. Retrieved 2012-11-12. ↑ CD-210PU USB interface portable CD-ROM drive. TEAC. Retrieved 2007-10-08. 1 2 "Intellectual Property & Standards/Licensing Programs". Philips. Retrieved 2010-07-27. ↑ "Pocket guide to recognising pirate music products" (PDF). International Federation of the Phonographic Industry. Retrieved 2010-07-27.